Nokia Announces Symbian Smartphones to Pack NFC Starting in 2011 | NFC Times – Near Field Communication and all contactless technology. The man Nokia has called upon to revamp its troubled smartphone division announced today that Nokia's Symbian smartphones will support NFC starting in 2011. Nokia veteran Anssi Vanjoki, who will head Nokia’s new Mobile Solutions division starting in July, told an audience at the 10th anniversary meeting of the mobile-banking group Mobey Forum in Finland today that Nokia remains committed to NFC. He said Nokia considered the time right to support NFC in a variety of devices and not just those ordered by mobile operators. But the spokesman declined to say which quarter the first NFC-enabled Symbian phones would arrive. And phones produced specially for certain countries may not contain the technology. Also, Vanjoki was not clear about the type of chips the phones would support to store payment and other secure applications. There would be options for secure applications, however, he said. The news of Nokia’s plans for the NFC-based smartphones was welcomed, at least cautiously, by mobile operators and service providers, which have complained about the scarcity of NFC devices. UPDATE: Mikko Haikonen, a senior manager at Nokia, speaking at the Contactless Cards and Payments conference June 22, declined to offer more details about Nokia's plans for NFC-enabled smartphones when asked by NFC Times. UPDATE: Dave Birch, a director at UK-based Consult Hyperion, who attended the Mobey Forum meeting, said he understood Vanjoki to mean all new Symbian phones announced in 2011 will support NFC. And that doesn't necessarily mean every model announced next year will actually arrive on store shelves before the end of the year. "Is that enough for people to build plans on? No, because to build a business plan, you need to know what model, when, SWP, not SWP, what APIs will be available," he told NFC Times. "It’s a big deal. It’s important news. Does it redefine the NFC market? I don’t think it does. Van Wezel added that the industry would be eager to learn more details about Nokia’s implementation of the NFC phones. But he and Mobey Executive Director Liisa Kanniainen noted that following Vanjoki's keynote address to the forum, Vanjoki indicated that Nokia would not limit the NFC phones to one type of secure element, such as SIM cards and the single-wire protocol connection between the SIM and NFC chips. “In principal, no business model is excluded,” Van Wezel said. Mobile operators will also be interested in the type of secure elements Nokia supports in the phones, especially whether they enable SIMs to store secure applications with the single-wire protocol, or SWP, connection. "If we can market our services using those phones, we welcome it," Vincent Barnaud, director of contacless solutions at France Telecom-Orange, told NFC Times. Orange is a strong backer of the single-wire protocol, a standard Nokia originally opposed. But writing on Symbian news and blog site All About Symbian.com, Rafe Blandford expected only a "select number" of NFC-based Symbian phones at some point in 2011, since NFC isn't a feature in the current Symbian^3 operating system, but is planned for the next version. "Nokia is not making a commitment to include NFC in all of its smartphones in 2011," Blandford writes. "Rather, it is saying that it will start to introduce it into its smartphone portfolio in 2011. As with other technologies that Nokia has introduced in recent years, e.g. GPS, it will likely first appear in high-end devices and then trickle down to lower end devices over time." While the fourth-generation iPhone, introduced last week, will not support NFC, makers of smartphones supporting Google's Android operating system are planning to introduce models by the first quarter of 2011, perhaps earlier, sources have told NFC Times. One of Vanjoki’s main tasks in his new post will be to beat back challenges from the iPhone, Research in Motion's BlackBerrys and Android phones that have cut into Nokia’s leading market share for smartphones the past couple of years. He apparently believes NFC can help him do it. Nokia is not expanding NFC to what it calls its mobile-computer devices based on the MeeGo platform, at least not yet, said Nokia’s Markus. Vanjoki also oversees these devices. Until the reorganization takes effect in July, Vanjoki serves as Nokia's executive vice president for markets. Before that, he headed Nokia’s multimedia unit and was responsible for launching Nokia’s N-series smartphones. That includes the popular N-95. Vanjoki also serves on Nokia’s executive board. The announcement comes as Nokia is winding down production of its last individual NFC phone model, the 6212. NFC Times has learned production will end for the mid-tier feature phone this month. Although not particularly popular among consumers, it remains one of the few NFC models commercially available, at present. Nokia has notified distributors and systems integrators of the plans to discontinue the model, which has been a workhorse in NFC trials and a few rollouts for over nearly two years. 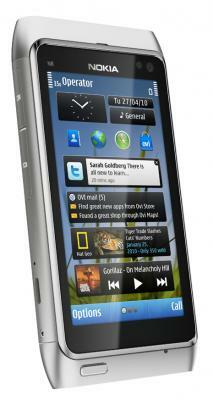 Nokia announced the model, its first 3G-NFC phone, in spring 2008. (Search the Project Database). Nokia earlier this year cancelled a companion model to the 6212, the 6216, which was to support the single-wire protocol. That cancellation had caused many in the industry to question Nokia’s commitment to NFC. The handset maker was a co-founder of the NFC Forum with NFC co-creators NXP Semiconductors and Sony Corp. in 2004. Janne Pyrrö of Finland-based RFID and NFC systems integrator Top Tunniste, a distributor of the 6212, advises organizers of trials and rollouts using the handset to order replacement phones while supplies last. Inventories are dwindling, however. Top Tunniste had fewer than 100 on hand earlier this week, he told NFC Times. The halt to production is not unexpected, Pyrrö, added.